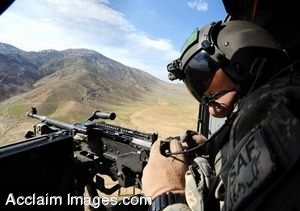 Description: Clip art photograph of a U.S. Army flying crewchief as he scans the skies while en route to Forward Operating Base Airborne, in the Wardak Province of Afghanistan, during a recent support mission for U.S. Secretary of Defense Robert M. Gates. (DoD photo by Master Sgt. Jerry Morrison, U.S. Air Force). Clipart photograph by Department of Defense Public Domain.